In June 2013 the scale of government mass surveillance of agencies, like NSA and GCHQ, were leaked by Edward Snowden. This project intends to raise awareness by designing a fictional monitoring software and its possible consequences. 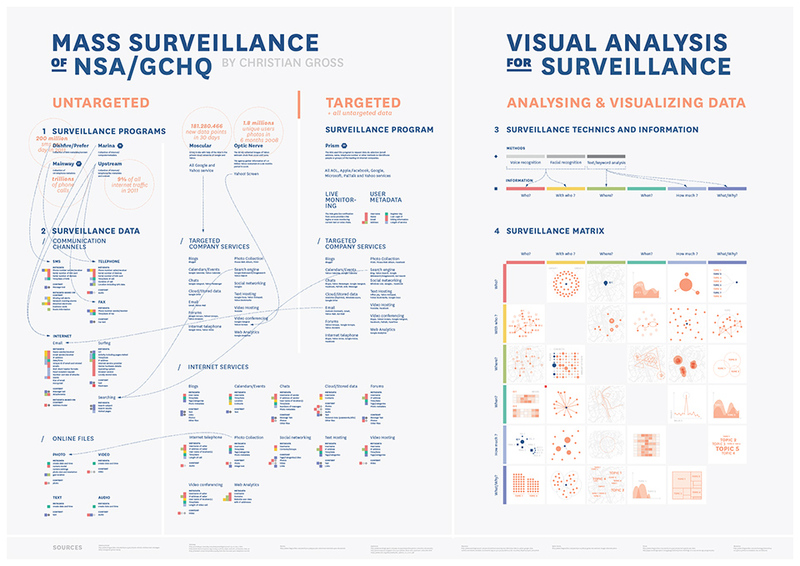 The main aim is to visualize how the surveillance agencies work and how easy a normal citizen with his or her personal data can come into focus of government agencies. The fictional surveillance software designed, should provide a role reversal with the agencies to understand the dangers posed by the collection of our data. 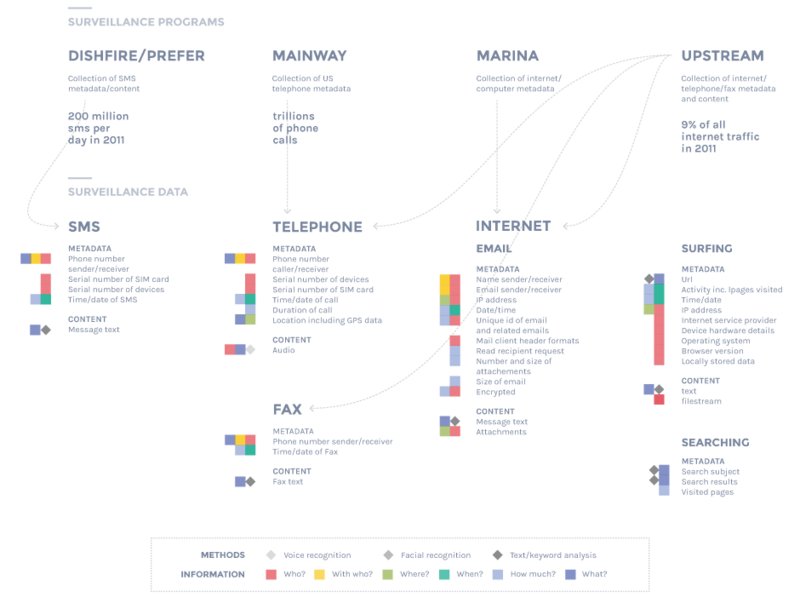 The overview summarizes the current suspects. Every person, who acts differently in the agency’s perspective, like searching for certain topics on Google, could be a suspect. New suspects, which the system filtered out being suspicious, are highlighted and can further be analyzed being potentially dangerous. 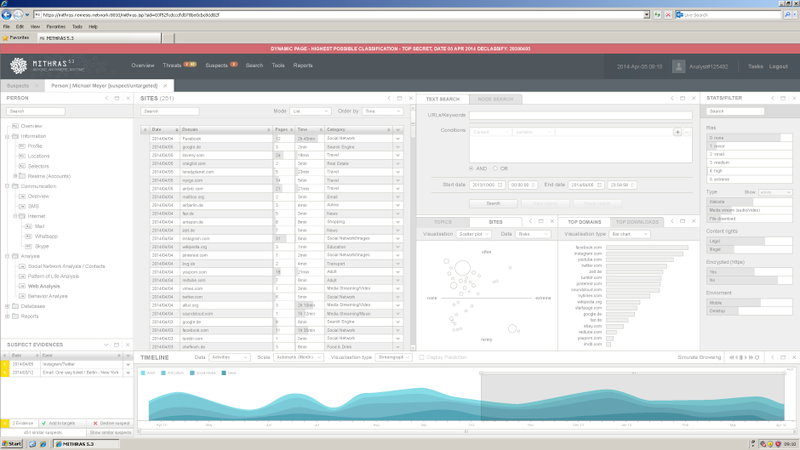 The software allows the analyst to sort, filter, and search. A map gives the analyst an additional overview of the geographical risk areas. The profile gives an overview of a certain person. It is used to get a first impression of a suspect and can turn the suspect into a possible target. The personal data consists of name, age, nationality, physical characteristics, current location and agency specific information like number of collected online and telephone data. 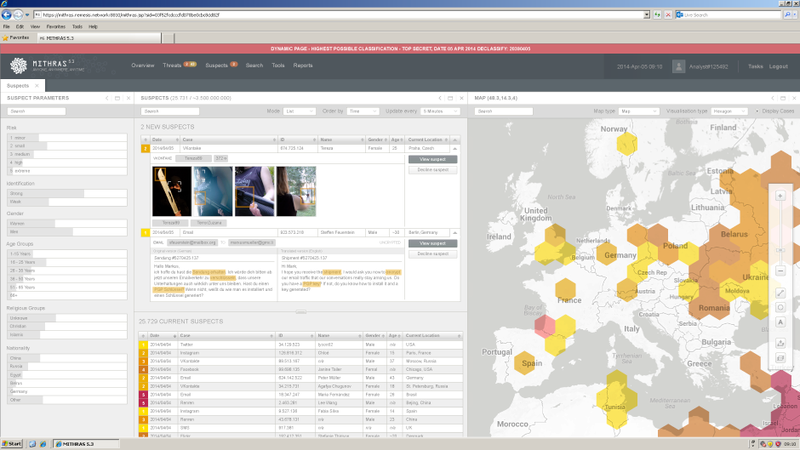 'Media' allows the analyst to see and analyze the content of different social networks and internet services. 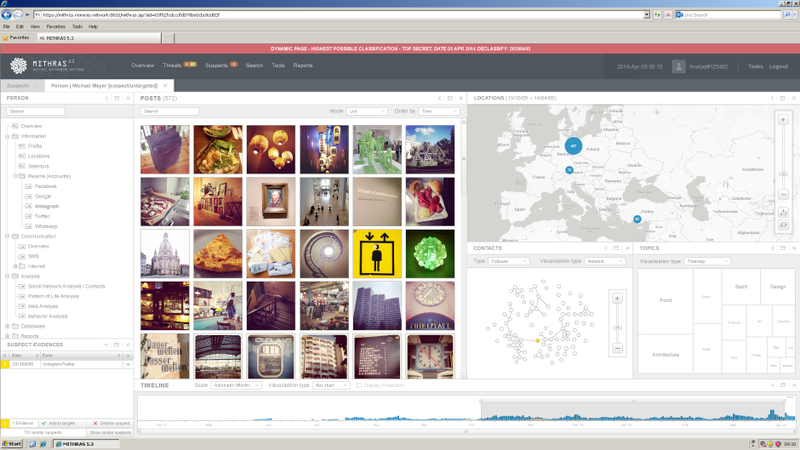 Using the example of Instagram, the analyst receives a first glimpse of the suspects' daily life. The content of the most pictures seem to be trivial, but they contain important metadata, like the place where the picture was taken and with whom. The exchange of messages via SMS or email forms a large part of our global communication. The collection of these channels exposes worldwide social relations and the everyday behavior of humans. When and how often we communicate with a person could give an agency information about our next purchase, illness or possible terrorist attack. The analyst uses the collected emails to find interesting events in the subjects' past and to analyze its communication behavior. 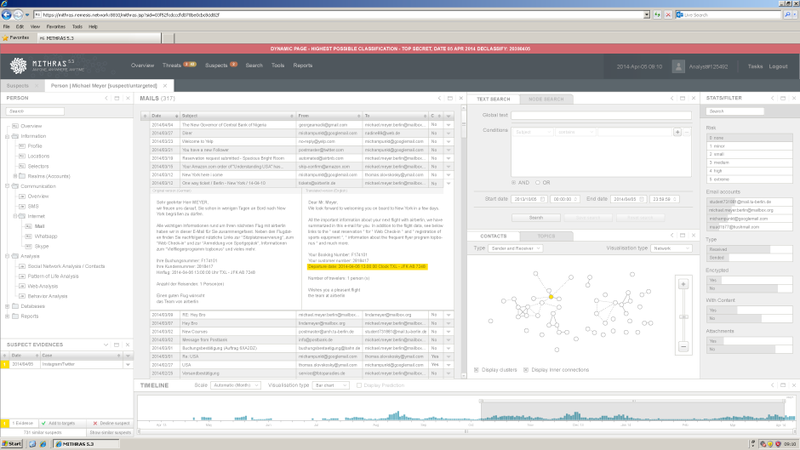 Web analysis tools show an overview of all visited websites. The high number of pages and their content form a detailed image of the suspects' interests. 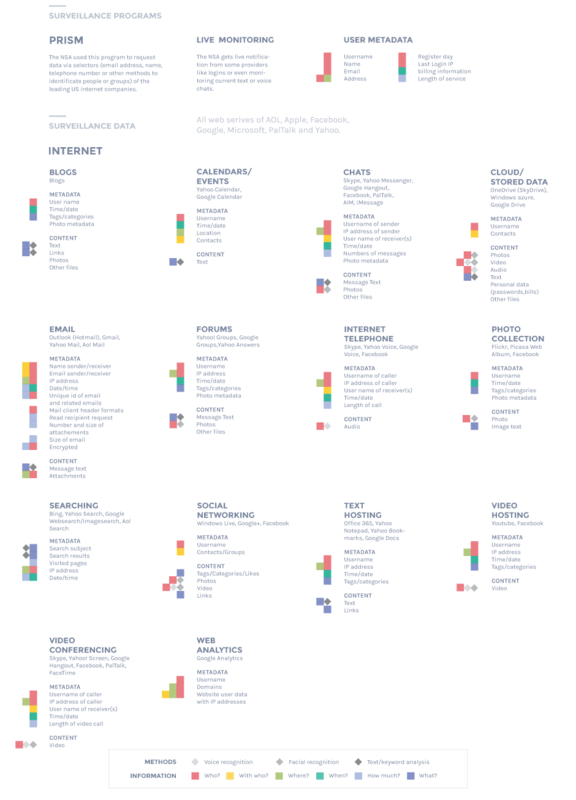 The picture is formed by statistical analysis of the most visited pages, their risk factors and their legal information. In addition, search functions and timeline allow goal-oriented research in the past of the suspect. 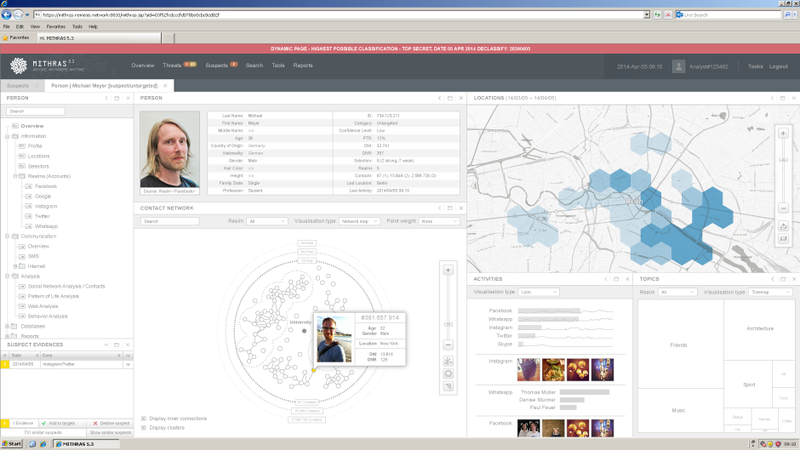 The contacts show the analyst an overview of the suspect's social networks: with whom the person most frequently communicated or met and gives him further information about the suspect's life, its contacts and is able to sort them according to specific criteria, such as gender, age, contact number and their connection. In addition, a map and several diagrams give more information about the suspect's contacts, such as the location or their profession. The localization of a suspect is an important part of mass surveillance. The agencies are collecting this data for example from mobile phones. 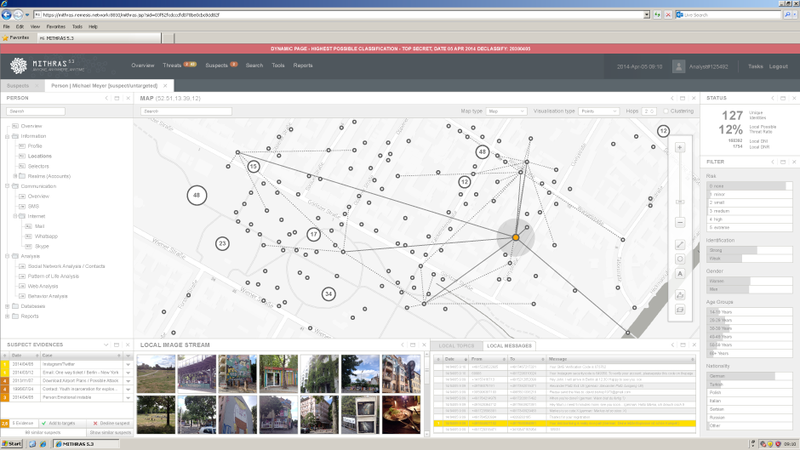 In this project the application gives the analyst not only the location of a suspect and its contact. The analyst also gets an overview of all located and identified persons. That means everybody, who is in the nearest distance of the suspect, can become a suspect too. These people can be filtered according to demographic criteria such as age or nationality. In addition, all media and messages that have emerged in this area can be queried and displayed. The analyst gets a bird's eye view of the suspect's digital world and their contacts. The leaked surveillance programs of the NSA and GCHQ give an example of global mass surveillance that takes place in most countries. Mass surveillance is targeted at the entire population. Untargeted mass surveillance affects every single person and represents the biggest part of government surveillance. The programs listed below show which communication channels are used by the NSA/GCHQ to monitor us. Targeted mass surveillance collects data from criminals, terrorists and even politicians (of other countries). The agencies combine the data of the untargeted surveillance with targeted methods to get as much data of the targeted person as possible. The list below shows that the NSA has considerable access to US internet providers and their data. The collected data is processed by different information techniques and statistical methods. 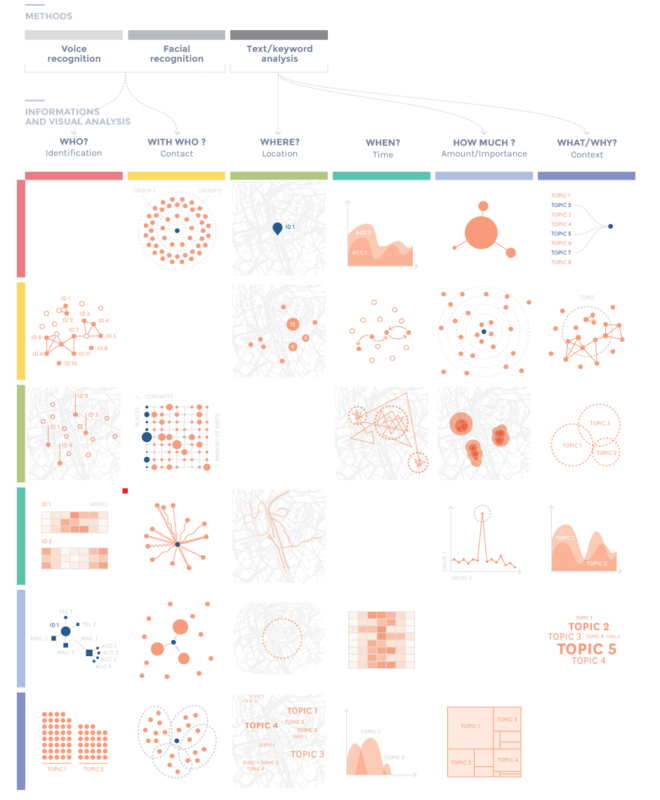 The resulting information is presented with the help of data visualization programs, to get quick insight and to make further actions possible. According to the government agencies the main purpose of the government mass surveillance is to prevent and prosecute crime. How far their goals correspond with the mass monitoring of the population is anyone’s guess. with the knowledge being monitored. The state has the monopoly of force. In contrast to the private data collectors such as Facebook or Google, the state has the power to punish or even kill its citizen in some countries. for example: doctors, lawyer, politicians, activists, etc. We do not know how and why the algorithms find us guilty and have no way to respond. especially if one considers that in case of the NSA scandal private sector companies cooperate with the state. Companies like Dell or Booz Allen Hamilton earn money with that kind of services. Data can possibly be used against us. Laws or social systems can change. There are examples in our recent history showing how data can be used against a person or a group to persecute them. There are ways to protect yourself against mass surveillance or at least complicate the work of the intelligence agencies. Considering which data has to be shown on the Internet, by keeping in mind that there will always be the possibility that the data may be collected by another person or organization. Data should be encrypted as much as possible in order to protect the contents from intelligence agencies or third parties. An open source and established system like PGP (Pretty Good Privacy) should be used. For the intelligence community, it is important to connect the collected data with a certain person or group. This can be prevented by concealing its identity and origin. Example: pseudonym instead of real names. as Jabber (XMPP), where it is easily to encrypt messages by OTR and also protect their content. Applications supporting Jabber are for example, Pidgin or Adium. like Threema, Chatsecure or TextSecure. such as Mozilla Firefox. In these programmers and security experts can look for errors and security risks. Firefox also allows development of plugins that secure internet-surfing. for different purposes to complicate tracking. in the form of HTTP. The browser plugin HTTPS-Everywhere of EFF is trying to automatically establish an encrypted connection for most sites. Websites like Facebook try to track users on the internet to analyze their surf behavior. This data can also get into the hands of the secret services. Browser plugins such as disconnect or Ghostery can protect us against the tracking. Websites can store data on your browser. This method can also be used to identify users and their actions. It is best to block third-party cookies, as long as it is possible. instead of Google or Bing use startpage, DuckDuckGo or Metager. Their main goal is to protect our privacy and there is no evidences that they are member of the PRISM program. like Tor, JonDo or I2P to conceal the identity and origin as best as possible. which are specialized on secure email services. Examples: mailbox.org, posteo.de or protonmail.ch. like Mozilla Mozilla Thunderbird instead of Online Services. These allow to write messages offline and at best encrypt them, to provide maximum protection. that can be selected depending on the purpose to hide the identity. by PGP for Windows and Mac. like Bitmessage a P2P encrypted communication protocol, thats works completely decentralized. of cloud service offerings. This offer is a convenient method to retrieve private information anywhere. 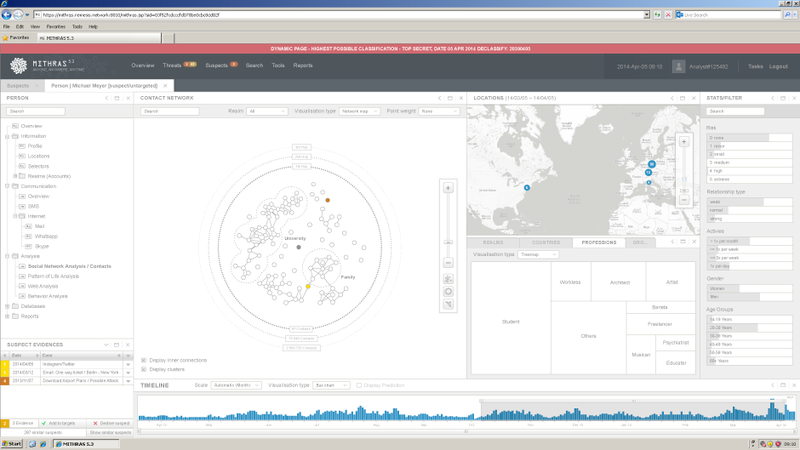 This allows intelligence agencies to collect and analyze data in large scale. Usage of computer-side encryption with normal cloud services. There are services like Boxcryptor or Viivo, which greatly simplify the encoding of data to Dropbox and Co.. Additional, there is also free software such as encfs to encrypt the data before uploading it to the cloud. as wuala, securesafe or Spiederoak. The website is a part of the bachelor thesis "Interface design in government surveillance between fiction and reality" by Christian Laesser. It was created at the University of Applied Sciences Potsdam under the supervision of Prof. Boris Müller and Prof. Dr. Marian Dörk between March and June 2014. Thanks goes to my supervisors Boris Müller and Marian Dörk for their great help and guidance. Thanks to Sören and Christoph for their help with the video shooting and Lorcan for the voice over. Special thanks goes to Claudia who listens to every thought and helped me out in so many parts of the project. Thanks!